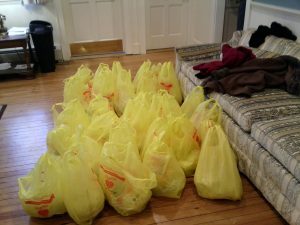 Help make Thanksgiving a little brighter for a needy neighbor. 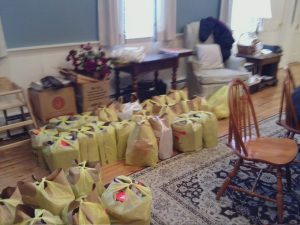 New Hempstead Church has a long tradition of donating “Thanksgiving Baskets” to local families in need. Be sure to bring your food items to church on Sunday, November 19 so that we can distribute them before Thanksgiving. You can also sponsor a basket, and we’ll do the shopping for you. We’ll need volunteers on November 19 to shop and assemble the baskets. 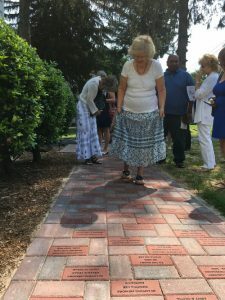 Our “Memorial Walkway” was dedicated on Sunday, August 20, 2017. Thanks to Karl Witte, his family, his scout troop and the scouting parents for their help. Our Annual Spring Tag Sale will be held on June 3, from 9 AM til 2 PM! There is a huge variety of items on display: furniture, books, appliances, clothing, toys, games and household items of every description. Also, baked goods and grilled foods will be available for munching. Grab the kids and come visit. We’re at the corner of New Hempstead road and Route 45. 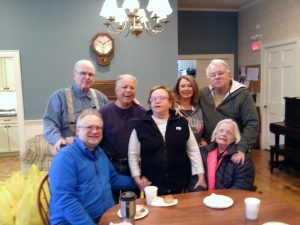 Saturday, May 6 is Church Care Day. We will be meeting at 9 AM and working around the church until around noon. Coffee and bagels will be provided. You are urged to bring gardening gloves, rakes, etc depending on which tasks you wish to tackle. Kristin is preparing the 2017 directory. If your contact information has changed: name, address, email, phone, please contact the office. Also, if your email address has changed, contact Bob Philhower so you will continue to receive the newsletter.